AVRFuses is a simple fuse programmer for the AVR series of microcontrollers from Atmel. It is written to mimic the look, feel and utility of the AVR Studio fuse programmer. The primary useful feature of AVRFuses is that it lets you intelligently select which fuses to set just like in AVRStudio. You don’t need to know bit numbers or have the data sheet handy like in most other programmers. It does this by using the exact same part configurations as AVR Studio does. AVR Studio is free from Atmel, but it only works in Windows. This program was written to bring some of it’s functionality to Mac OS X. Thanks for spending time to create AVRFuses. I have been trying to keep minimal changes to the Makefile created by AVRStudio4 so that my work on the Mac will be seamless when used back on the PC. AVRStudio Makefile generates EEPROM hex files with ‘eep’ extension, and your current version of AVRFuses doesn’t allow selection of such files; I have to make that amendment either by renaming or editing Makefile for every project. How about this minor inclusion in the next version? Great utility!!! Very usefull for beginners like me. Thanks. Absolutely astounding, AVRfuses was suggested to me at exactly the right moment: I wanted to make an ATmega8 run off an external crystal and I was quite worried about getting the fuses right, as I have already locked myself out of a tiny2313 in the past by accidentally disabling /RESET. This made it a breeze. This is fantastic – thanks so much! Please keep up the excellent work, and develop this further! Does AVRFuses work with AVRMacPack? I have installed AVRMacPack on my MacBook and entered the installation location for AVRMacPack as the “Path to avrdude”. I have also discovered one issue: When selecting a slower baud rate i.e. 4800 in the Preferences, all operations always fails. When using command line (-B 4800) it works fine. Well, AVRFuses did work with AVRMacPack for me, just that you have to set the right path for avrdude which is a hidden file. I went to the applications folder, where shortcut to AVRMacPack manual was located and right clicked it to show the original file. Avrdude was lying someone there. Could you modify the Fuses window so that it scrolls horizontally as well as vertically? I’d like to be able to read all of the information off the right-hand side of the window. Thanks a lot for the program, helped me mess with fuses on some AVR’s it’s way easier than messing with avrdude. Also thanks for outputting the command line that is very useful to see what is happening. And another request (don’t you just love it…). Would it be possible to specify where the avrdude.conf file is located ? Very useful program and thanks for putting in the effort. this is a wonderful tool. although avrdude is prepared for this chip. Great Program! Looks nice and works like a charm on my mac! There is a floating “display fuses” button in this program. Can you fix and update? usb port, the new device is called ” XWUSBASP ” and made by ” XWOPEN “. Can you please support my programmer, please. AVR Fuses is a great program! Thank you very much! But I have one problem. The Fuses texts are not shown completely and appear truncated. Could you please fix this? That would be really great! Just tried it on a mac to deactivate the external crystal for the internal one in my Arduino. Support for attiny4313 would be nice. Or can I add support myself? I just want to thanks to you! Hi, thanks for your great work! Just a little feedback for the new Update (V 1.4.7): Resize the Window while in the Fuses Tab and the “Low”, “High” and “Extended” Labels stay at their position instead of moving with the textfields. If you could fix that…? which then lead me to this page. So I want to thank you very much. The patch you mentioned there really did the trick for me to be able to use the AVRISP MKII with Mountain Lion together with libusbx and libusb-compat. Not sure if this solves the root cause, but as a work-around it did the job. 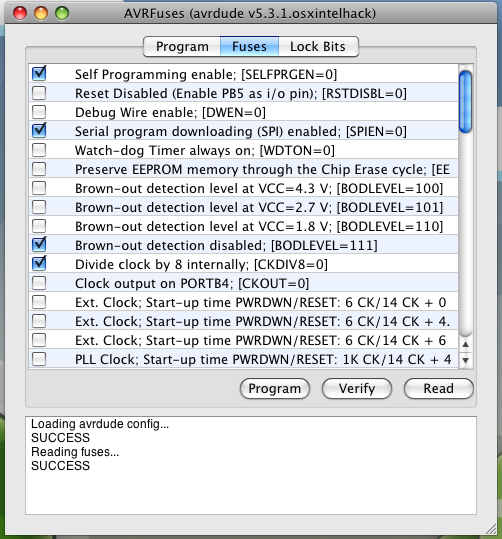 I installed AVRfuses 1.4.6 on a mac running OS X 10.7.5 (11G3), as soon as I launch AVRfuses, the application quites. 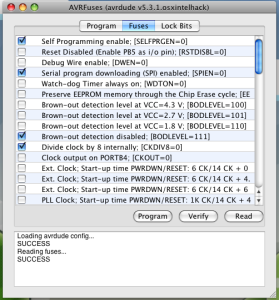 Is AVRfuses compatible with Mac OS X Lion ? I’m having problems getting AVRFuses working on 10.8.5 with a plain installation of CrossPack. ‘avrdude’ is version 5.11.1, and it’s at /usr/local/CrossPack-AVR/bin/avrdude. When AVRFuses comes up and displays the panel to select the programmer preferences, the programmer pull down is empty. I make a symlink to avrdude in /usr/local/bin, but that didn’t help. I looked for any hard-coded paths in your executable, but didn’t see any, so… I’m trying to figure out what’s so different on this system from yours. Jason fixed my problem by pointing me to AVRFuses 1.4.7, which works great. Thanks, Jason! can you tell me how mike’s problem fixed? I’m having problem same like Mike. I really appreciate the programm. Eclipse avr plugin failed on my mac. This tool flashed the hex file. Thanks a lot! could you make them copy-able ? very useful program. Thanks. Please, can you add, in the FUSE page, also the LOCKBIT fuses ? Where is the avrdude located on Mac OS X? Thank You, it works fine with my Atmega 128A. Only one short remark is that i have to select the Atmega128 option even for my 128A also otherwise it does not work. It was a little bit confusing for the first time but nevertheless it’s a “must have” tool for the AVR programmers under OSX. Thank you sooo much for the latest update allowing to copy from the log windows ! I could not run the latest version (AVRFuses 1.4.11) unfortunately, because I can use only Apple OSX 10.11.6 on my Mac. I would be very happy if you could adapt the app for this operating system. this software really works, and this is what is important! BTW does any of you know what does + 0ms, + 4 ms, + 64 ms means when selecting the clock? using Mac version and I am happy with it! Where to download Windows version?